I am a rabbi, born into a multigenerational rabbinic family, and none of the rabbis I have known in my family believe in God. We all talk about God, pray with god language, and are comfortable with questions about God asked in study sessions and private counseling. How is that possible? I don’t have to struggle with the questions “Where was God during the Holocaust?” or “Why did God let cancer take my friend’s life?” Rather, I get to study and struggle with the questions of good and evil in human beings and culture, and I get to engage with survivors in deep and loving ways while they ask the hard questions that arise in difficult times. I also get to wonder at the mystery of creation, of scientific inquiry, and of the beauty of nature. I get to imagine a peaceful world, and hold others and myself responsible for bringing it to fruition. And, I get to talk with, argue with, and question God, as taught to us in our ancestral stories in the Torah (the first five books of the Bible). In my worldview, to believe in God is to limit God, to make God only as big as our collective human imagination. To know God, makes God even as small as my own, individual imagination. Therefore, to believe in God is to limit God to a “thing,” something to own and manipulate and put on a pedestal like a statue carved by its earthly maker and set aside when other more beautiful works or ideas come along. In my worldview, there is nothing more sacred or beautiful than engaging in question, imagining, and having the strength to suspend disbelief long enough to pray. It’s in the paradox of suspending disbelief, that the human mind does some of its most graceful acrobatics. So, for those who are looking for an answer to the question “Can I be Jewish and not believe in God?” you are in good company. See, I am a Reform/Progressive rabbi, but my teachers and my relatives are from all streams of Judaism, including Hasidic/ultra-Orthodox. What I have found by living and studying with Jews is that sometimes, the most practiced and storied people are the ones who believe the least. Conversely, the ones who have the least amount of ritual practice and knowledge of our traditions and our stories, are the ones who fall back on belief as a way of engaging. The more people learn, the more questions are raised, and more questions can lead to more engagement. If you find yourself questioning belief in God or throwing the whole “Jewish thing” out altogether, ask yourself a question. Ask yourself a little question about your current life circumstances or a big question about the nature of life or the future of the world. And, if nothing else helps, bring in a little God talk or maybe a prayer or maybe a story about God that is written in the Torah, and see if bringing your thinking in touch with your imagination and the imaginings of generations doesn’t open a whole new set of possibilities. You should never be asked to agree blindly or to demean your own views for others (or theirs for yours, for that matter); rather, you should be engaged in a multigenerational, multicultural, engendered, geopolitical, cross-economic community of wisdom that brings Bigness to the table. Rabbi Lev Baesh was ordained as a rabbi in the Reform Movement of Judaism in 1994 at Hebrew Union College–Jewish Institute of Religion in Cincinnati, Ohio, and holds a JD (law degree) from Benjamin N. Cardozo School of Law at Yeshiva University in New York City. He recently added RN (registered nurse) to his spiritual and practical work after graduating from Regis College–Lawrence Memorial Hospital’s nursing program in Medford, Massachusetts, in May 2013. 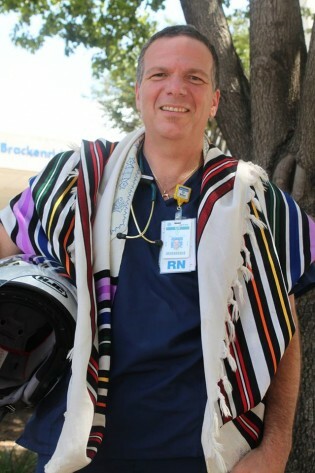 Along with serving the Jewish community and Interfaith families, he works as a nurse at the University Medical Center Brackenridge in Austin, Texas. Excellent article. You have put my personal feelings into well conceived thoughts. Thank you, Lev, for sharing your ideas on the concept of God – believing or not believing. I appreciate your suggestion that to believe in God is to limit God. Part of believing in God pushes us to define this God in which we believe; to find words to describe and to communicate to others what we mean when we refer to God. Using our feeble language, created by humans, we cannot help but to limit God. God is beyond our understanding and beyond our ability to define this thing/idea/presence we call God. Once we attach human language to something that cannot be captured by language, we wrap God in a circle of words. Human words don’t even come close to defining something that exists outside of language. Language came with the evolution of humanity. But we are talkers so therefore it is not surprising that we turn to language (prayer, discussion, study) to share our hearts and minds with each other.